Sister Catherine Georgine Portner, O.S.F. 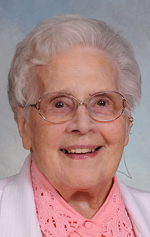 Sister Catherine Georgine Portner, O.S.F., 99, died Oct. 10 in Assisi House, Aston. She had been a professed member of the Sisters of St. Francis of Philadelphia for 81 years. Sister Catherine Georgine (nee Gertrude Mary Portner) was born in Mahanoy City, Pa., where she was a member of St. Fidelis Parish. She entered the congregation in 1932 and professed her first vows in 1936. Sister Catherine Georgine earned a Bachelor of Music degree from Marywood College and an M.A. from the Catholic University of America. She ministered primarily in elementary education. Sister Catherine Georgine ministered for 26 years in the Archdiocese of Philadelphia. She taught at St. Alphonsus School and at St. Benedict School. In 2001 she began volunteering in the Sisters of St. Francis finance office located in Our Lady of Angels Convent in Aston. In 2012 she became a resident of Assisi House, the congregation’s retirement residence in Aston, where she served in prayer ministry and, for several years, continued her volunteer work in the finance office. Other ministry included service as a teacher or principal in the Diocese of Trenton for 28 years, the Diocese of Harrisburg for six years and the Archdiocese of Baltimore for nine years. She also ministered for 12 years in the Diocese of Allentown, serving as a caregiver for a family member in Mahanoy City. The funeral Mass for Sister Catherine Georgine was celebrated Oct. 13 at Assisi House. Burial was in Our Lady of Angels Cemetery in Aston. Sister Catherine Georgine is survived by her niece Kay, cousins, and by her Franciscan family. Donations in her name can be made to the Sisters of St. Francis Foundation, 609 S. Convent Road, Aston, PA 19014.